It is at dusk that our imaginations and fears start to play tricks on our minds. The sun-filled, logical part of the day is over. Twilight deepens. Looming shadows, the scuttling of animals, and eerie, indiscernible shapes; the witching hour approaches. This is the time, walking home from work on a cold winter’s night, when your brain conjures up all those things that go bump in the night. You walk faster, trying to get ahead of the possible footsteps behind you, jump at the tree branch when it brushes your shoulder, and peer ahead into the gloom, trying desperately to make out what the troll-like shape is in front of you (it’s a wheelie bin). Now, transfer those feelings of wintery evening walks back to a time when people still actually believed in the creatures of the night, to a time when such mythological creatures were symbols of doom, and to a time when they were used as warnings; to frighten and warn people away from religious and moral transgressions. In the 15th, 16th, and 17th centuries, witch-hunts were a prevalent issue. Folk-stories about wolves and other predators waiting in the depths of forests were used to frighten small children into being good. Tales such as these, which the Brothers Grimm were so good as to collect for us, were allegories for good and evil. The unknown and the unexplained were evil, the known and explainable were good. Leonardo da Vinci. Study for the Fight against the Dragon, c. 1480. Pen and ink, grey wash, 19 x 12.5 cm. Musée du Louvre, Paris. Artists of these time periods were able to use these stories and their own imaginations to create works to frighten, intrigue, and instruct. 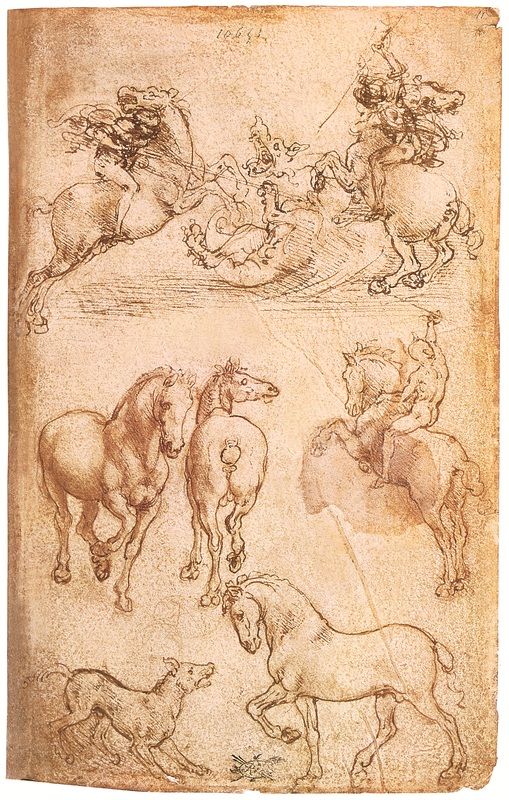 Leonardo da Vinci was one such artist. Perhaps best-known for the Mona Lisa, the Virgin of the Rocks etc., it is also true that he composed many studies using mythological creatures. In one such, his study of a knight killing a dragon is both fantastical and allegorical; the dragon being the symbol of evil, and the knight-in-shining-armour… well, being the knight-in-shining-armour. Hieronymus Bosch. 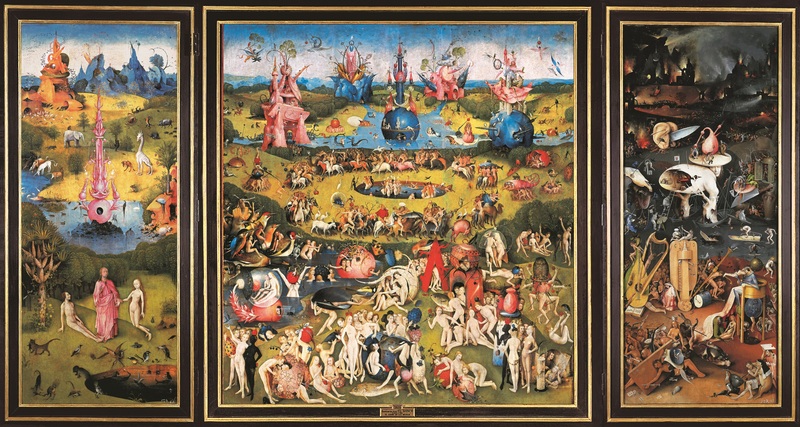 The Garden of Earthly Delights, c. 1500-1505. Oil on panel, 220 x 389 cm (triptych). Museo Nacional del Prado, Madrid. So, it seems that every century has had a creepy, winter’s night walk feeling. But the best part about experiencing it in this century? For me, it’s getting into my warm, well-lit hallway, and laughing at myself for all the stories I’ve been making up in my head. I’ll take the walk over a witch-hunt any day! To experience the mythical and the monstrous, without having to endure the feeling that ghouls and ghosties are on your trail, check out the Beautiful Monsters exhibition at the Art Gallery of Alberta, Edmonton(Canada). Being held until the 3rd March 2013, banish your winter blues by taking a walk on the mythological wild side with artists such as Dürer, Callot, and Beham. For a perhaps more local night in (and what could be more local than your own sitting room?) try cosying up to a copy of John Bascom’s Beauty of the Beast. Next Entry Rodin, das Fleisch, der Marmor.